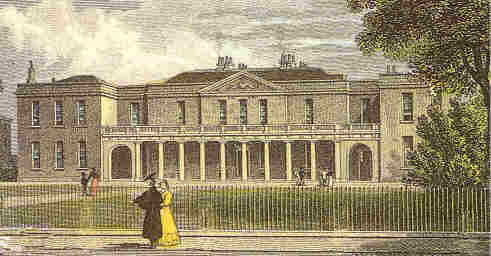 John Addenbrook, a leading Cambridge physician, left his fortune to found this hospital. The original building in Trumpington Street (right) opened in 1766 and continued in use until 1984 when a move was made to a new site in Hills Road. Not much of the old Georgian building survives as it was largely rebuilt in 1865. Gonville and Caius college has several medical connections. John Caius, its founder, was a London physician of the 16th century and William Harvey was a student here between 1593 and 1599. The college library is of particular interest in having a fine collection of 16th and 17th century medical works from Padua . Although it is not open to the public it may be visited by special appointment. The old Cavendish Laboratory in Free School Lane is associated in most peoples' minds with physicists like Ernest Rutherford and J. J. Thomson. But it was also the laboratory where Francis Crick and James Watson performed their pioneering work on the structure of DNA which has revolutionised our understanding and subsequent practical application of the principles of genetics. While he was unravelling the structure of DNA, Crick lived at 19/20 Portugal Place. The house was, until recently, commemorated by a golden helix mounted above the front door. Also in Free School Lane, the Whipple Museum of the History of Science, (01223-335540) is open from 1.30pm to 4.30 p.m. Mondays to Fridays in term times and on Saturdays during the special exhibitions. It contains a small collection of scientific instruments mainly relating to physics. Of medical interest is a Nairne's patent medico-electrical machine of 1785 and an electro-cardiogram dating from1923. A variety of early microscopes are on display. There is also a library of about 1000 books published between the 17th and 19th centuries on scientific topics. The University Botanic Garden, founded in 1761 as a small garden of 5 acres in the centre of Cambridge, was re-sited in 1831. The present garden was established by Professor J S Henslow as a University teaching and research resource. Henslow recognised the need to study plants in their own right to discover how they worked, and how they could be used. He planned a garden large enough to accommodate many species, including trees, and particularly those which were then being discovered in North America and Eastern Asia. The Glasshouse Range dates from 1880-89, but has been partly rebuilt since. Admission charges A charge is made from 1 March to 31 October and on all weekends and Bank Holidays throughout the year. Admission is free on weekdays at all other times. Visiting parties are welcome but must book in advance (tel: 01223 336265). Guided tours by the Friends are available by arrangement (telephone:01223 336271). 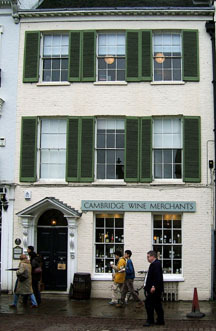 The Cambridgeshire and County Folk Museum at 2-3 Castle Street has, amongst its varied artefacts, a number of medical items. A plaque on the wall of 2 King’s Parade commemorates Dr George Cunningham (1852–1919) who practised dentistry here from the late 1870’s until the First World War. In 1893, he won the gold medal of the World Dental Congress for his essay on 'Tooth Preservation'. He pioneered preventative dentistry, and taught that tooth decay could be prevented by regular dental checks after the age of six before the appearance of the permanent teeth. He persuaded Cambridge council to appoint a dentist to inspect elementary school children's teeth. He founded the Cambridge Dental Institute. He also made a short film called Came the Dawn, a copy of which has recently been acquired by the Wellcome Library. Monastic Infirmary. Amongst the cluster of ruined monastic buildings are the remains of the former infirmary. One of the buildings known as Powcher's Hall was once the blood-letting house of the monastery. The monks were bled several times a year by application of leeches, a procedure thought necessary to maintain good health. In 1917, Sir Pendrill Varrier-Jones founded a tuberculosis hospital and sanatorium at Papworth, twelve miles west of Cambridge, where patients in all stages of the disease were treated. In addition, his scheme involved the construction of a village settlement where people with tuberculosis could live and work in a rural environment with their families. As soon as patients were well enough, they were set to work at carpentry, joinery, cabinet-making, poultry farming, cobbling, tailoring, leatherwork, printing, horticulture, sign writing and handmade jewellery. Papworth Industries became a great financial success expanding turnover from £410 in 1918 to £100,000 in 1938. The cottages were semi-detached two storey dwellings with an upstairs veranda. The windows had to be kept permanently open to insure a liberal circulation of fresh air. Ornaments and wallpaper were forbidden because they might collect germs. There were eight cottages in 1928, the number of which increased to 142 in 1938 when the total population of the settlement was around 1000. The settlement enjoyed all the usual amenities of village life: school, post office, pub, general store, church and chapel as well as a cinema and open air swimming pool. Papworth Settlement continued to accommodate tuberculous patients until 1957 when its scope broadened to include handicapped people in general. The administration of the hospital was separated from the rest of the scheme in 1948 when the NHS was introduced. More recently Papworth hospital has become a centre for transplant surgery.